Constructed from rugged .020" white flexible plastic. All prices are unit costs. Both the ru50 6” ruler and the ru60 6” ruler with slot are the same price. With 1 color imprint on 1 side. The rulers on this page are accurate plus or minus 1/32" and are not precision measuring instruments. 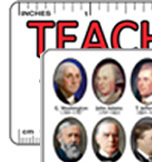 Union Plastic Rulers - these custom imprinted Union rulers are Union made in the USA, and Union printed by American workers.